Wood used to be seen as an optional, luxury flourish on custom displays. But now, for some of our customers, it’s considered an industry standard of design. Machinery advances have expanded capabilities, reducing size and cost. As a result, it's no longer a matter of whether you'll add those special touches to your custom display; it's a question of which ones you’ll choose. Customers find that the creativity, versatility and unique quality of mixed-media displays can quickly establish credibility and recognition for a brand. This type of custom display is a good visual demonstration of both attention to detail and openness to new ideas – traits you want tied to your brand. As a result, we offer woodworking solutions for mixed-media pieces when we develop your custom display. From cutting to edge banding, our woodworking capabilities ensure that your custom display has a seamless finish. 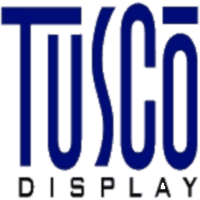 Tusco strives to complete and deliver high-performing results but keep project costs low. Wood parts for your fixture can be cut automatically using our computerized Komo VR Mach One S router. We are also equipped with an edge-bander to apply matching laminate edges to ensure a polished finished product that is up to your design specifications. Going beyond aesthetic appeal, edge banding helps physically reinforce your display from wear-and-tear. Whether you are keeping it on display for a long season or facing storage needs, edge banding finishes the product to retain structural integrity and last over time. In addition to wood, we can tackle plastic components in a similar vein. There are times when displays need plastic components that can be treated as wood. Reasons for this range from cost to resistance to weather considerations. Our ability to adapt to the materials you need is just one example of how we stay nimble. Edge banding machines ensure that custom display designs are faithfully duplicated over time, whether it's to create more displays or to expand upon existing ones. With this comes branding continuity across multiple displays, cutting design costs and reinforcing your brand’s identity. To address the wide range of woodworking, edge banding and other custom display options available, give us a call at 740-206-8298.